ab11197 recognises the human MUC2 mucin, and shows no cross-reactivity with MUC1, MUC3 or MUC4 mucins. In tissue sections ab11197 recognises colon, liver and prostate tissues strongly. The antibody recognises malignant colonic mucosa as well as normal mucosa. We have removed mouse from our list of reactive species based on contradictory results from researchers. 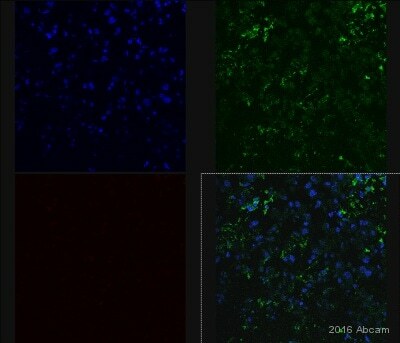 We have had increased reports of negative staining results in IHC-P with mouse tissue. We do not batch test this antibody with mouse and we will no longer guarantee it for mouse reactivity. Purified IgG prepared by affinity chromatography from tissue culture supernatant. Our Abpromise guarantee covers the use of ab11197 in the following tested applications. IHC-P Use at an assay dependent concentration. This product does not require protein digestion or antigen retrieval using heat treatment prior to staining of paraffin sections. WB Use at an assay dependent concentration. Predicted molecular weight: 621.5 kDa. Contains 1 TIL (trypsin inhibitory-like) domain. May undergo proteolytic cleavage in the outer mucus layer of the colon, contributing to the expanded volume and loose nature of this layer which allows for bacterial colonization in contrast to the inner mucus layer which is dense and devoid of bacteria. At low pH of 6 and under, undergoes autocatalytic cleavage in vitro in the N-terminal region of the fourth VWD domain. It is likely that this also occurs in vivo and is triggered by the low pH of the late secretory pathway. Secreted. In the intestine, secreted into the inner and outer mucus layers. Publishing research using ab11197? Please let us know so that we can cite the reference in this datasheet. One of our customers ordered ab11197 and would like to get additional data regarding the immunogen used to produce the antibody. Could you share some data regarding the immunogen? Unfortunately, we are not able to release the immunogen sequence for this particular antibody as it is proprietary information. We aim to provide as much information as possible to our customers, so I am sorry that this has not been possible on this occasion. One of our customers has ordered ab11197. Could you recommend of a working dilution for the antibody? What is the recommended gel type and it's concentration for detection of Muc2 which is more than 600Kda big? Thank you very muchfor your kind support. According to our Technical FAQs, we would like to suggest to use 1 ug/ml as a starting concentration for this antibody. Regarding the gel we would like suggest to use a gel between 5% and 7.5%. Please take care with the handling as they are very delicate and easy to rip. 1. Don't use PVDF membrane, nitrocellulose membrane works much better. 2. Use Tris-glycine based buffers. 3. Transfer should be longer and lower temperature (overnight at 4C and at 30V). 4. Use 2 pieces of Wattman for each part of the "sandwich". 5. Add some more SDS to the system than for normal standard WB, add 2 ml of 10% SDS to 2 l of transfer buffer which is Tris based. In addition, a wet transfer may be more sufficient than a semi-dry. Guilmeau S et al. Heterogeneity of Jagged1 expression in human and mouse intestinal tumors: implications for targeting Notch signaling. Oncogene : (2009). WB; Mouse. I need to know some information of the antibody anti-MUC2 (ab11197) before to buy it. I need to know if this antibody recognises the mature mucin or the inmmature mucin (O-glycosylations or not). I need a antibody for WB and IF which recognises both mucins. We have not specifically tested this antibody on immature and mature mucin. However, I have done some research. There's a paper which looks at O-glycosylation of MUC2. 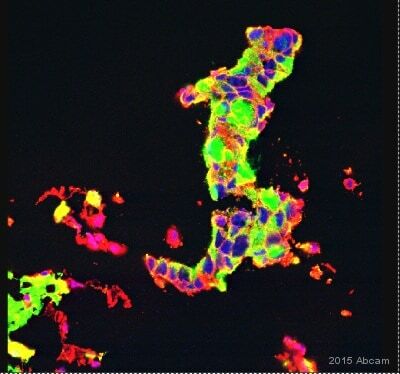 Specifically, this paper notices aberrant glycosylation of MUC-2 in diseased tissue. 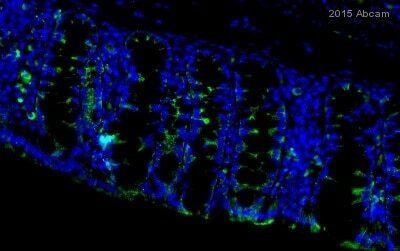 Because this antibody recognizes both malignant and normal mucosa and the O-glycosylation differs depending on the disease state, it is unlikely that the glycosylation state of the protein has an effect on antibody recognition. I hope this helps, but please let me know if you have any follow up questions.